Home » News and Stuff » Uncategorized » It’s One Week After Publication! It’s One Week After Publication! Seven days ago, on World Book Day, I was delighted to be invited into a local school (where my wife just happens to be the Deputy Head!) to celebrate the launch of ‘The Great Chocoplot’. It was a day that I never thought would happen – the day a book, written by me ,would be published! A week later, it still seems mad! 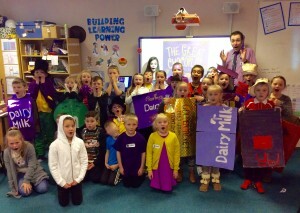 The pupils of Year 3 did a fantastic job of getting dressed up as their favourite chocolate bar, or in the purple and gold colours of my book cover. We started the day by picking out M & Ms and answering questions depending on their colour. Who doesn’t love a sneaky bit of chocolate at 9:15am? Followed by activities around the book’s illustrations by Lalalimola, where pupils were invited to describe what they thought the characters looked like. They came up with loads of great words! We had fun creating bookmarks made out of our own designs of chocolate bars and made up lots a fab new chocolatey names. 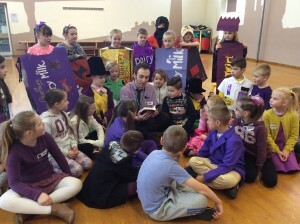 I was honoured to be asked to present awards to the winners of the best costume in all year groups and got to read some of my story to very attentive children. They even giggled at some funny bits! A reporter and photographer came along to record the day for a local newspaper and in the afternoon, while I signed loads of books, we had a chocolate party. It was brilliant! A huge thank you to all the children and to the staff for making the day so special. I will be adding a gallery page to this site soon, so I will be able to share some of the great pictures taken. Including lots of #ChocolatePanicFace pics! !